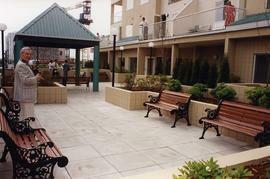 Photograph depicts the rear courtyard at B'nai B'rith Manor. 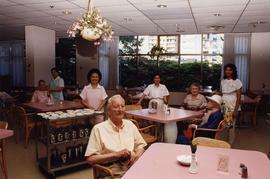 Photograph depicts staff and residents in the Haro Park Centre dining area. Written on verso: page 6 - top. Photograph depicts seniors apartment building Haro Park Centre. Written on verso: page 6 - bottom. Photograph depicts seniors apartment building Haro Park Centre.